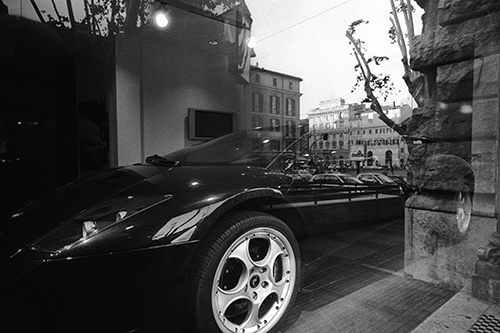 I made this image while we were in Rome and wandered past a Lamborghini dealership. And there, just on the other side of the glass, was one. I became aware that the plate glass window was reflecting what was on the street but yet I could still see the car inside. With some maneuvering back and forth and up and down, I finally got the split I wanted with the car melding into the scene outside and, at the same time, I realized this was likely about as close as I was ever going to get to one of these cars. Thinking of owning one was nothing but in my dreams! The image was captured with a Leica M6 camera with a Leica 35mm ASPH lens on Ilford black and white film.